Did you know that your favorite dragons have a new book out? Titled Dragons Love Tacos 2: The Sequel, it’s about traveling through time to save the tacos. Inspired by the book, we made a simple time machine craft so we could travel back in time to plant taco trees throughout history so the dragons never have to worry about their favorite food becoming extinct. *This post contains affiliate links. We also received a free copy for review from Penguin Random House. All opinions expressed are my own. Please read our full disclosure here. The book has just the right amount of quirky silliness to keep kids engaged. Besides being the adorable dragon characters loved by kids, you can count on them to be predictable…. in a good way. The ending will have LOL-ing even if you guessed how the story would end! Recommended for preschoolers and kindergartners. Since the dragons travel back in time to save the tacos, we decided to make a simple time machine craft. Cut out the center circle of the paper plate. If using cardboard, use a compass or trace a circular object. Print the graphic, I used half a sheet. Trim around the out edges a bit to make a circle shape. Glue to the graphic to the center of the plate. Poke a hole in the middle. Open the paper clip by bending it to create the spinner. Place a brad/paper fastener through it. Stick through the hole you poked. Bend the sides don on the under-side, but not too tight or it won’t spin. Divide the rim into sections. We have 8 spaces on ours. Use the brown watercolor to paint the white ring/outer rim. Let dry. Take a black marker or black paint to outline around the graphic and the outer edge as well as the lines dividing the sections. Now you’re ready to travel and save the tacos like the dragons did in the book! 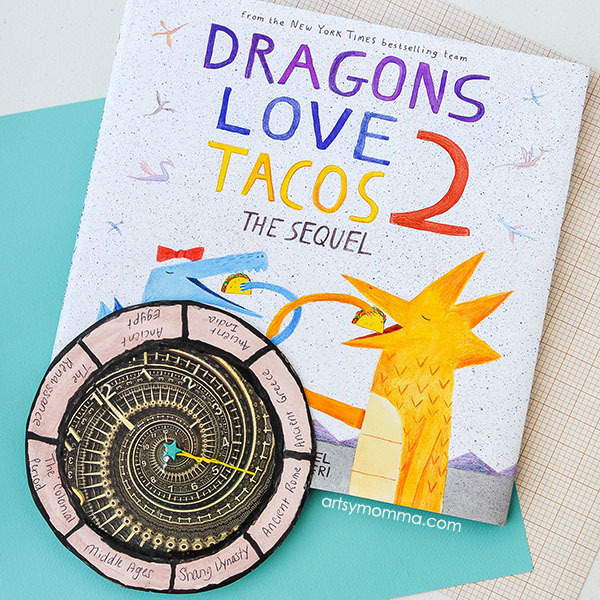 Enter for a chance to be one (1) grand prize winner and receive a set of Dragons Love Tacos and Dragons Love Tacos 2: The Sequel (ARV: $17.99 each), or to be one (1) of five (5) second place winners to receive Dragons Love Tacos 2 (ARC: $17.99 each). NO PURCHASE NECESSARY. Enter between 12:00 AM Eastern Time on May 1, 2017 and 12:00 AM on May 29, 2017. Open to residents of the fifty United States and the District of Columbia who are 13 and older. Winners will be selected at random on or about June 2, 2017. Odds of winning depend on the number of eligible entries received. Void where prohibited or restricted by law. 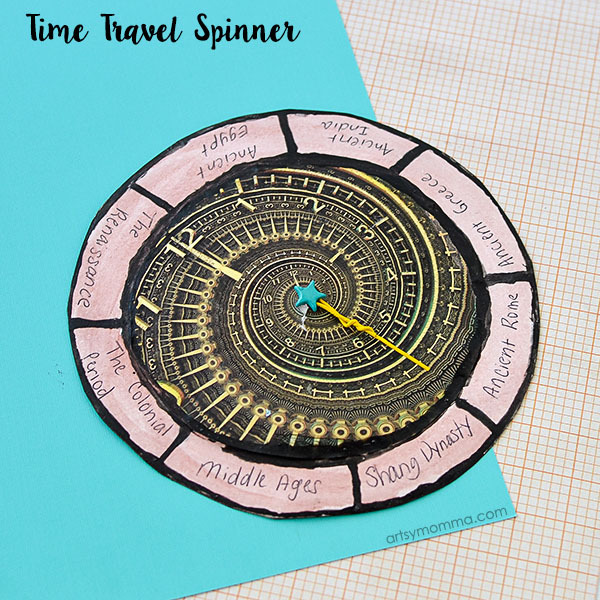 We hope to see your fun DIY time machine spinners and would love to have you join us over on Instagram! Tag @artsymomma_amanda and use the hashtag #worldhistoryforkids so others can see your awesome creations. You can show us your fun time machines and time travel crafts, activities and crafts about a specific time period or any multicultural lesson plan you did (Join us at the end of July for a two week Around the World Summer Camp!). Thanks for the post on Dragons Love Tacos. The craft will be a hit with my grandsons. Great idea for a craft for the kids! 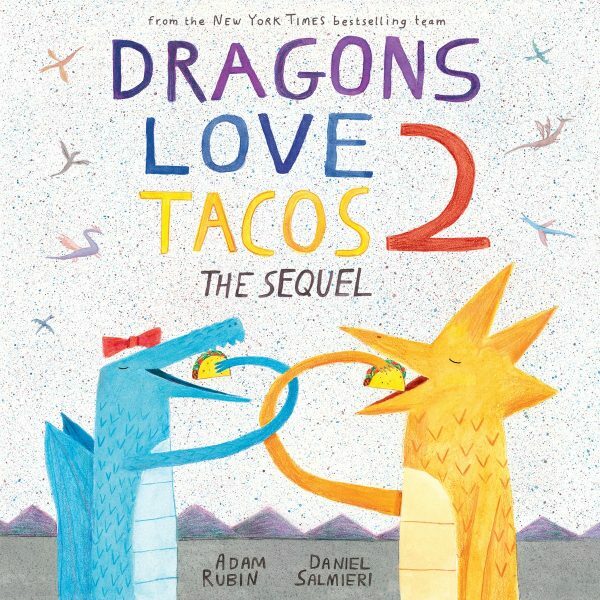 My guys love the Dragon Love Tacos books. I would like to personally congratulate you as your blog Artsy Momma has been selected by our panelist as one of the Top 100 Kids Activities Blogs on the web. I personally give you a high-five and want to thank you for your contribution to this world. This is the most comprehensive list of Top 100 Kids Activities Blogs on the internet and I’m honored to have you as part of this!